If Michael Jackson were to write a song about this razor, it would be called “Bad.” If this razor were a woman, it would be Roseanne Barr. If this razor were a space shuttle, it would be the Challenger. If this razor were a car, it would be a Ford Festiva. If this razor were a Band-Aid, it would be the kind that doesn’t have enough adhesive to stick. The Xtreme3 is loaded with three blades as the name would suggest. It’s called the Fitstyle Refresh because it has a strip below the razor with both a mysterious “pre-shave oil” and Vitamin E, meant to coat your skin as you glide along the rest of your face. Though marketed as having a “new refreshing scented handle for an invigorating shave,” I didn’t find that to be the case. While I was shaving with it, I didn’t notice any additional scent, so I placed it directly under my nose to take a whiff and still couldn’t detect a scent other than a plastic handle. I smelled all four razors in the package and none of them smelled like anything. According to the packaging the razor came in, the Fitstyle Refresh is the “#1 flexible blade disposable razor.” But I wouldn’t agree it all; I don’t even think it’s the #1 disposable razor in its own family, sort of like Emilio Estevez. There is no way it is better than the Schick Xtreme3 (Martin Sheen) or the Schick Hydro 5 Power Select (Charlie Sheen). 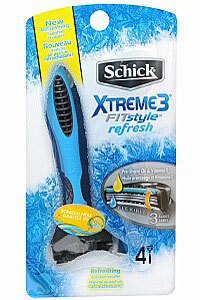 Compared to several of Schick’s other offerings, I wasn’t very impressed with the Xtreme3 Fitstyle Refresh. I found it to be incredibly stiff, like Newt Gingrich at a Wham reunion concert, because it didn’t move with the contours of my face at all. I know it’s a disposable razor, but there was no weight to it whatsoever, which I think was a problem in terms of effectiveness. Several times during the shave, I had to re-shave an area more than once, particularly the area where my mustache would be if I could grow one. Which is pretty bad, because if you can grow a mustache, plan on shaving that area about five times. And getting way more chicks than me; congrats. Somehow, it took more skin off of my face than hair. I was extremely disappointed with the lack of effectiveness exhibited by the Fitstyle Refresh. Ff you want a good disposable razor from Schick, check out the Schick Xtreme3 or the Schick Hydro 5 Power Select instead.